Tree Branch Trail is the eighth level of the third world in Paper Mario: Sticker Star. This is a simple, two screen level where one of the Wiggler Segments can be found stuck in a web at the beginning of the level. Mario starts the level in an area with a poisonous pond that circles a platform. The Wiggler Segment can be found stuck in a web at the top of this platform, but it is too high for Mario to reach with his basic jump. To reach the segment, Mario must head right through the pathway, while battling Ninjis, Scuttlebugs and a single Snifit in the poison pool. There are a few ? Blocks in this area. 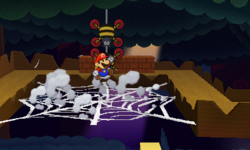 By heading to the right, Mario is taken to an area with a giant web on the floor, and two Snifits underneath it. There is also a secret poison hot spring in this area, with two Snifits in it. Located next to this poison hot spring is a giant tree with branches that serve as platforms. Now, Mario must head left, until he eventually finds another giant web. He must now jump enough times to destroy the web, opening access to a branch that takes Mario to the segment. By following the branches on the giant trees, Mario eventually finds the Wiggler Segment, and releases it by hitting the web with his hammer a few times. After doing this, the Wiggler Segment engages in battle with Mario. The segment then joins Mario after being defeated. The Comet Piece can be found after taking a passage located behind a bush in the area with the poison hot spring. When Mario comes back here after defeating Gooper Blooper, he'll find a Watch Battery that was hidden under the poison and the two Snifits that were inside the hot spring are not there anymore. The location of the Secret Door can be found in the beginning of the level, in the wall near the Ninji. The door takes Mario to a secret room containing the Tape thing.